From the past, we learn. For the future, we yearn. But in the present, we earn the capacity to discern. Missing the moment dislodges us from our pivot, disrupts our view, displaces our perspective, distances us from reality, and disconnects us from both past and future. Moments are what we have right now. Tricky as they are, illusive as they may be, fleeting and they appear, they are what we have. They are present with us ... which is truth. Whether or not we are present for them, is our choice. If we miss them, we miss all that is wrapped up in their packages and we fail to see that the present is a gift and thus, it is so called. There is so much happening, all at the same time, right now. 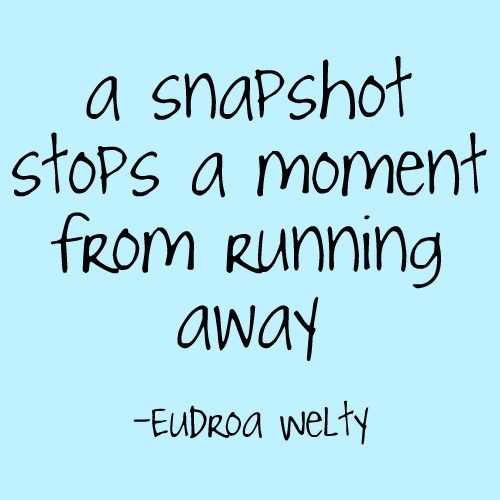 And if you must, and you must, capture some moments with a camera, a poem, or a song, remember the words of Eurdora Welty.